We’ve introduced some changes to LibrarySearch since the launch of our new library management system last summer. Here’s how to get the best out of LibrarySearch and your library account. Firstly, make sure you’re logged in to LibrarySearch – you’ll be able to access ‘My Library Account’ and also get access to all our subscribed electronic resources. If a book you’re interested in is out on loan, make sure you place a request on the book via LibrarySearch. Go to the Get It section of the item record and click on Request. You can also request books which are available in the library but please remember, it may be quicker for you to go to the library and locate the book yourself if you need it urgently. You can choose which Cardiff University library you collect your request from: if you know you can only get to a library on e.g. Sunday, choose to collect your request from one of the libraries open on a Sunday! This can be particularly useful during vacation times when the library opening hours are subject to change. Remember, you must be logged in to LibrarySearch to request items! You’ll receive an email notifying you when your request is ready to collect. Requests are kept on the shelf for you for 2 days, so make sure you check your emails regularly. Your books will automatically renew unless they have been requested by another borrower or if they are 4 hour loans. If your book has been requested, you should receive an email to notify you: please check your emails regularly. You can also check the status of your books in ‘My Library Account’. 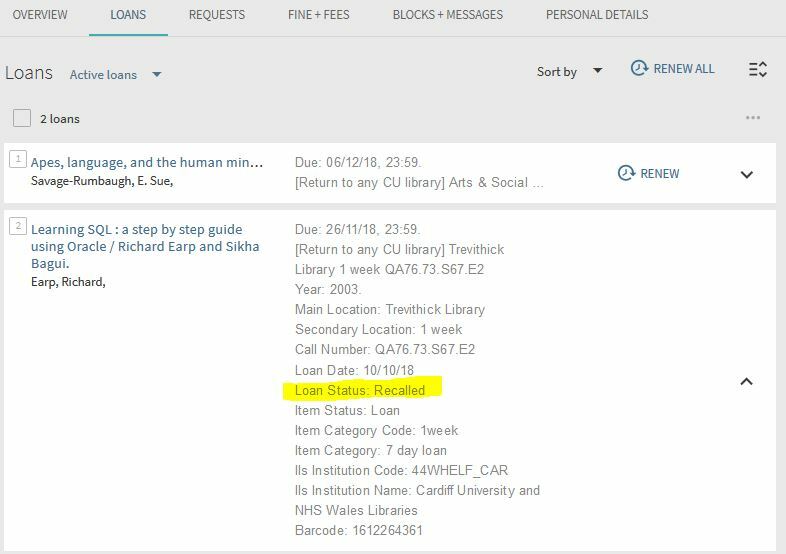 If there is no Renew option for an item or the Loan Status is ‘Recalled’, you will have to return the book by the due date listed to avoid fines. Automatic renewals now occur two days before the due date: this means you will get a couple of days notice if something is not renewable. You can also renew books yourself via LibrarySearch if they haven’t been requested. This gives you the option of trying to renew if, for example, you are going to be away from Cardiff for a few days. 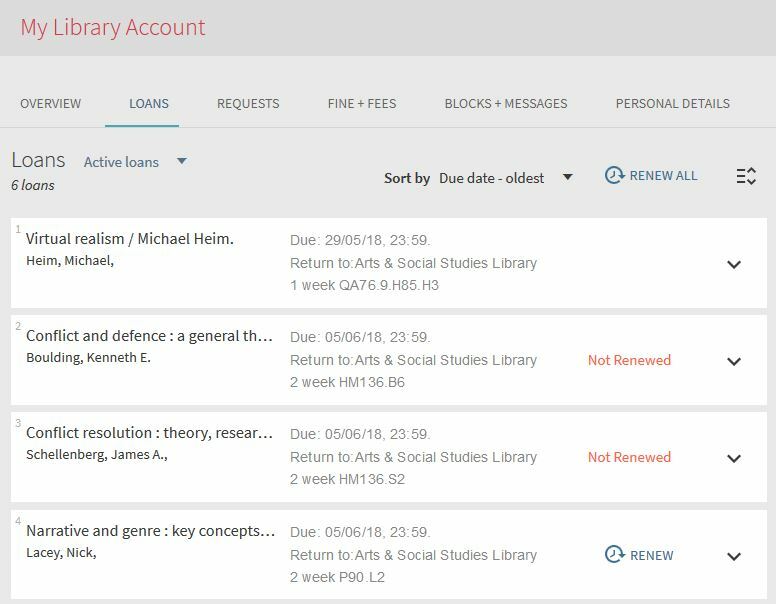 Here’s the renewal screen in My Library Account where you can renew items yourself: note, there is no renewal option for item 1 – this item has been recalled and needs to be returned by the due date to avoid fines. If you try to renew an item and see the ‘Not Renewed’ message, it may be that the item is already issued for the full loan period. You can click on the arrow to the right of the loan to see the Loan Status: if the status is Recalled, you will need to return the book by the due date. If you have any questions about requests or renewals, please speak to library staff.